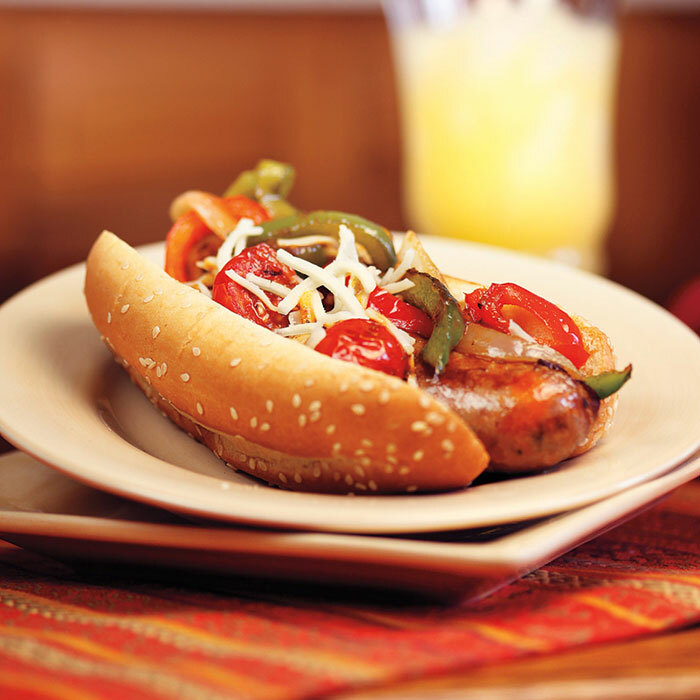 Be the hero of your next tailgate or game day party with these amazing Sausage Heros! In large saucepot, cook sausage over medium to medium-high heat 8 to 10 minutes, turning frequently with tongs to brown all sides. Stir in bell peppers and onions, and cook 7 to 8 minutes or until onions and peppers are lightly browned, stirring occasionally. Add garlic and Italian seasoning, and cook 1 minute, stirring frequently. Stir in tomato paste and cook 1 minute. Stir in tomatoes and cook 1 minute. Add water and stir to loosen brown bits from bottom of pot. Reduce heat to medium and simmer 15 minutes or until sausage is cooked through, stirring occasionally. Remove from heat. Stir in vinegar, salt, and pepper. Slice buns lengthwise in half, but do not cut all the way through the buns. Place 1 sausage into each bun. Spoon pepper mixture over sausage and sprinkle with cheese.